Kerrisdale Church is one of Heritage Vancouver’s Top Ten Endangered Sites. Every year, Heritage Vancouver comes out with a list of the Top Ten Endangered Sites around the city. Third on the list this year is Kerrisdale Baptist Church. Following is Heritage Vancouver’s description of (1) the threat to Kerrisdale Baptist and other Vancouver churches (2) why those churches are significant, and (3) what it would like to see done about the situation. 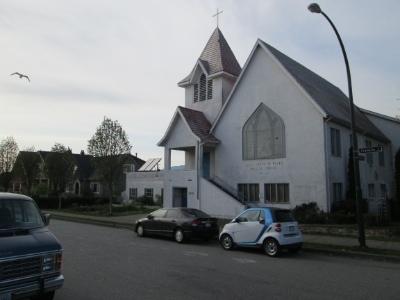 With declining attendance at many Vancouver churches, potential church closures are rampant, and threaten the loss of many significant heritage buildings. When these buildings close, Vancouver communities lose more than Sunday worship space; they lose space for the countless social and cultural activities that churches accommodate seven days a week. These churches, however, often sit on valuable land and are often sold for non-public uses. 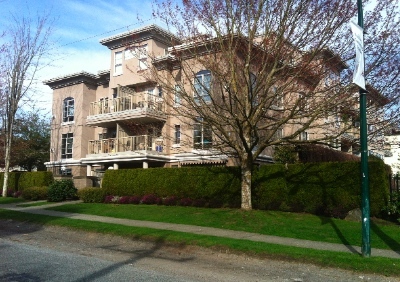 Kerrisdale Baptist Church at 5870 East Boulevard is an example of a church that has been sold recently. The new owner plans to demolish it and replace it with a six-storey residential building. Two Anglican Churches, St. Marks and St. David of Wales, sit empty, their future unknown. There are rumours of many more church closures in the near future. 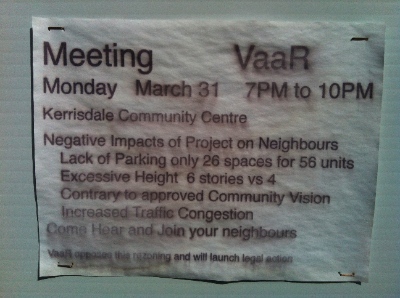 What is the threat to Kerrisdale Baptist & other Vancouver churches? In 2013, the old Kerrisdale Baptist church was closed and sold. The church is flanked by three to four-storey apartment buildings, and the land value and zoning create pressure to demolish the church for residential use. The current owner is proposing a six-storey residential building in its place. The RM-4 zoning allows currently for four stories. The city has told the owner that in order to achieve six stories he has to agree to dedicated rental units with commercial/retail at grade. Regardless of the outcome, the church is likely to be demolished since none of the current options incorporate even a portion of the church. In a little over a year, two century-old Anglican churches, St. Mark’s at 2950 Laurel Street (February, 2013) and St. David of Wales at 2475 Franklin Street (February, 2014) have stopped operating as Anglican Churches. The Church has not revealed its plans for the future of these churches and although they are not for sale, both could be threatened as they are sitting on valuable pieces of land. Why are Kerrisdale Baptist Church and other churches significant? St. Mark’s no longer holds worship services; the Anglican Church has yet to determine its future. Vancouver heritage churches are community landmarks, reminders of bygone years and beacons of serenity in a much more fast-paced era than the one in which they were built. These places of worship also accommodate countless social and cultural activities, seven days a week. As these churches are lost, we lose yet more of Vancouver’s dwindling community gathering space – the places where we can congregate, celebrate and communicate. Without places for groups to meet in our ever-denser city, many people will become isolated, diminishing our quality of life. Public space is essential to a healthy community, and churches represent a very significant amount of our city’s gathering spaces. This could soon change. Kerrisdale Baptist Church was rated as a heritage C building in a recent evaluation. It is unique in that it was built in 1912 as a Baptist Sunday School in Port Coquitlam, designed by the successful local architects J. P. Matheson & Son and moved to Kerrisdale in 1921. It was sold for $1 to the new Kerrisdale congregation and then moved 29 kilometres, overland and on a barge down the Pitt and Fraser Rivers, to its present location. Kerrisdale was a growing residential area, with local shops and services as well as good streetcar connections to downtown. As the congregation grew, the church was expanded in 1929 and 1947. From 1956-2012 it operated as a Christian Science Church, until it was closed and sold in 2013. Trinity United Church used to sit across Larch Street from St. Mark’s, but was torn down for this apartment building. The interior and exterior of the original small building were transformed into a handsome new church in 1929, by the addition of three wings designed by Sharp & Thompson, Vancouver’s longest serving architectural office. The present form was completed in 1947 with extensions and a new front entrance on the west side. This is a fine example of a ‘traditional’ BC church, with a steep roof, wooden structure, stucco exterior, with half-timbering on the gables and on the projecting entrance. The original windows include Tudor arched and rectangular forms, with multi-paned details; the Tudor arched forms continue at the projecting entrance bay with tall side windows and heavy timber doors. Although church attendance steadily decreased until the building was sold in 2013, the building was well maintained and appears to be in good condition. 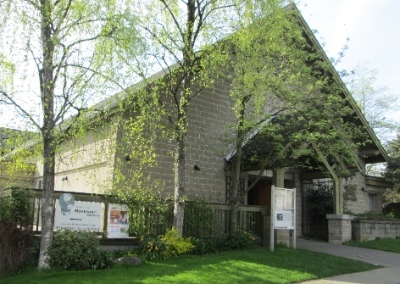 Another of Vancouver’s vacated heritage churches, St. David of Wales Anglican, is listed as a ‘B’ on the City of Vancouver’s heritage register. It is also home to a series of contemporary Stations of the Cross paintings by artist Chris Woods. St. Mark’s Anglican Church is a more modest building. In this case, its architectural heritage is considerably less important than its social and community aspects. Over the years this site has provided community lunch programs, performance space for musicians and a Montessori School. St. David of Wales in East Vancouver stopped operating as a church earlier this year. Heritage Vancouver strongly supports retaining our significant heritage churches. Our first preference is that if these buildings are no longer needed as places of worship, that they continue to provide a home for social and cultural activities in their communities. Where this is not feasible, we would like to see churches repurposed for housing, commercial uses or another community amenities, rather than being demolished. Add significant heritage religious buildings to the Heritage Register, which is being updated as a key part of the Heritage Action Plan approved in December 2013. 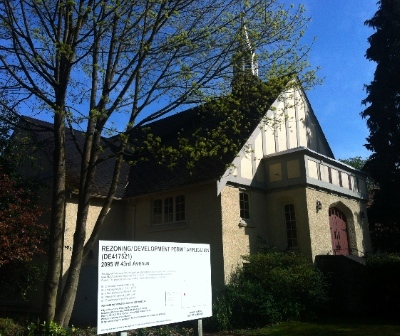 We encourage the City and the owners of the former Kerrisdale Baptist Church to postpone their current 6-storey building proposal in order to determine how the existing structure can be repurposed and incorporated into their current plan rather than being demolished. We encourage all church organizations to:. Work with the City to recognize the significance of their buildings, as owners need to agree to have their properties added to the Register. Inclusion on the Vancouver Heritage Register would give the community more time to work with each church organization to find compatible new uses for surplus buildings, and potentially unlock conservation incentives. Create a Churches Conservation Trust, similar to that created by the Church of England in 1969. Over 340 churches have been saved through ‘regeneration projects’ that repurpose buildings as community spaces. This comment is re-posted by permission. Heritage Vancouver’s executive director Janet Leduc encourages anyone interested in learning more about their work to email info@heritagevancouver.org. ← April 21 – 27: Worship Central, Bonsai Love, Two Popes Two Saints . . .
Flyn: St Mark’s congregation continues, and now worships in the St George’s building at 14th and Laurel. Not included in the Heritage Vancouver information is the fact that Kerrisdale Baptist continues to exist and flourish as Trinity Baptist Church, at 49th and Granville. The Kerrisdale facility was sold to Christian Science in the mid-50s, after the new church was built.